Space rocks – the first of their kind found on Earth – were taken from the excavation spot on Skye earlier this month in a “professional” raid in which a mini digger was used. Geologists say the removal of the deposits is “heartbreaking” and will hamper future research projects at the site. The area was previously targeted in September. Ten deposits were taken from the ‘incredibly fragile’ zone, each around a handful in size, and were put up for sale on eBay for just £10. Reinforced glass is now to be installed to prevent further damage to the area near Broadford. The site was only discovered in December last year and contains mineral material that matches samples taken in space. Experts warn that unauthorised removal of any of the deposit is against the law. Dr Simon Drake, who discovered the site along with Dr Andy Beard, said the latest theft was a “professional removal” for commercial gain. The lecturer from Birkbeck, University of London, said: “Up to a cubic metre of rock has been removed. The right-hand side of the outcrop has been cut into using a mini digger and picks and shovels. He added: “A conservation has been agreed regarding the site. Exposure will be behind toughened glass with an associated sign. Dr Drake and other geologists have appealed to meteorite collectors not to buy material taken from the site. Dr Rebecca Williams, the head of geology at Hull University, said: “We should not be forced into secrecy when publishing on rare geological exposures. “Shame on the rock merchant who did this. Learn some ethics. Graham Andrews, a volcanologist, added: “Destruction of a recently discovered and documented site in Scotland, probably to supply specimens to rockhounds. The team made the discovery while exploring volcanic rocks on the island which they thought were volcanic flow deposit. When they analysed the rock they discovered it contained rare minerals – vanadium-rich and niobium-rich osbornite, which have never been reported on this planet. The minerals have, however, been collected by Nasa’s Stardust Comet Sample Return Mission as space dust from the wake of the Wild 2 comet. 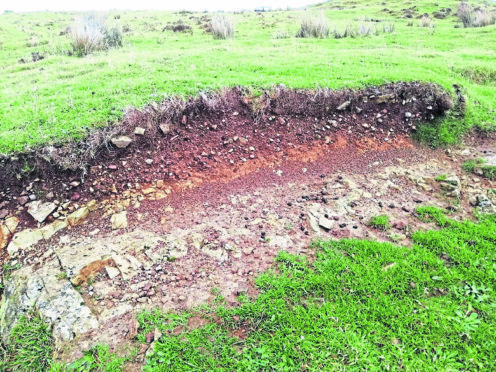 Scottish Natural Heritage said the unauthorised removal of any of the deposit could be in contravention of the Land Reform (Scotland) Act 2003.